This one is from a presentation (download) by Roberts et.al. from Cornell University titled “Life cycle assessment of biochar production from corn stover, yard waste, and switchgrass” held in in Boulder, CO in August 2009. I admit it is all new to me and I had to lookup stover and biochar on Wikipedia to understand what it is all about. So, apparently the slow pyrolysis process has several advantages: It works with waste biomass (waste management), it produces biochar that can improve soil, it produces energy (syngas) and it captures carbon. The Sankey diagram in the presentation shows the energy flows: 16,000 MJ of energy is contained in a tonne of stover; more than a fourth of it can be approved of as syngas from the pyrolysis process. 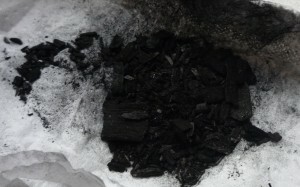 The main objective however seems to be carbon dioxide capture, and biochar presents a viable alternative to other (more energy intensive) carbon sequestration technologies. The diagram has a slight downwardish slope and some of the arrows have superfluous bends. Heat flows and heat recovery are in orange, losses in yellow, the feedstock and syngas in green. I was amazed after reading “The Biochar Revolution” from http://biochar-books.com/The_Biochar_Revolution.